Financing recommendations for a possible new 65,000-seat football stadium in San Diego are “reasonable and realistic” but face some risks, according to an analysis released Tuesday by the National University System Institute for Policy Research. While the nine-member advisory group appointed by Mayor Kevin Faulconer identified funding sources well in excess of the anticipated $1.1 billion cost of the project, more money will need to be found for operations and maintenance, NUSIPR President Erik Bruvold said. He also said he is concerned that the stadium as envisioned by the Chargers Stadium Advisory Group might not be competitive for premier events against other current generation facilities like the ones in Dallas, Santa Clara and under construction in Atlanta and Minneapolis. The price tag for the stadium itself, not including related infrastructure work, was projected by CSAG at $950 million. Bruvold said the past five NFL stadiums to be built have cost an average of $1.7 billion. That could lead to demands for more costly amenities, which would drive up the cost of the San Diego project and increase tensions between stakeholders, he said. On the plus side, CSAG’s projection of revenues is reasonable, and the share of public and private resources to be spent on construction seems advantageous to taxpayers, given San Diego’s market size, the report said. The Chargers and the city and county of San Diego are going through the group’s recommendations, and Faulconer has said he hopes that negotiations between the sides over a concrete plan will begin in a few weeks. Bruvold said a few more questions will have to be ironed out in the process, including who would assume the risks of cost overruns or funding shortfalls, and how to avoid lease provisions that backfire on one side or another. He said the task force conducted extensive research and analysis of NFL stadiums that have been constructed in recent years. Another consideration was to make sure the Chargers and other tenants would enjoy the financial benefits of a new playing facility, rather than designating all the new revenue streams for construction costs. The financing recommendations would have the Chargers pay $300 million in rent over 30 years, revenue that could be used to back construction bonds, and get the city and county to each kick in $121 million over three decades. 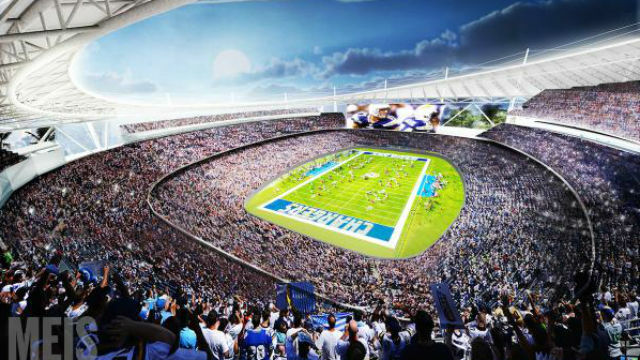 CSAG also projected that selling 75 acres at the current Qualcomm Stadium site to a developer could add $225 million. The group identified several other funding sources. A two-thirds public vote would not be needed since there is no tax increase, but Faulconer said he wants a final plan to go on an election ballet to get residents’ approval.